While it may not be entirely accurate in every sense, Saving Mr. Banks packs an emotional wallop in its telling of the tense pre-production period for Disney’s 1964 mega-success, Mary Poppins. 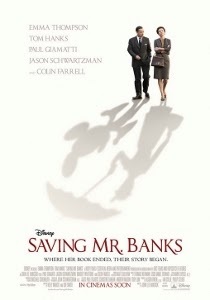 Directed by John Lee Hancock (acclaimed for his other biopics, The Rookie, The Blind Side), working from a screenplay by Kelly Marcel and Sue Smith, Mr. Banks couldn’t possibly be a completely objective depiction. It is, after all, Walt Disney Pictures producing a film that’s largely about Walt Disney (portrayed here by Tom Hanks). Walt pursued the film rights for Mary Poppins from the book’s author P.L. Travers (Emma Thompson) for 20 years before he finally convinced her to acquiesce. It’s possible their relationship was even more contentious than what’s seen in the film. Travers steadfastly did not want a film to be based on her pride and joy. As she explains from the outset, the characters of Mary Poppins and Mr. Banks are “family” to her. Walt not only acknowledges that – he strongly empathizes with the feeling. In one of Hanks’ finest moments as Walt, he recounts a time in his youth when he nearly gave in to pressure to sell the rights to Mickey Mouse. Walt is burning to make Mary Poppins, willing to give Travers unheard of creative control. She finally agrees to fly out to Hollywood for a two-week trial period, during which she’ll work with screenwriter Don DaGradi (Bradley Whitford) and songwriters Richard and Robert Sherman (Jason Schwartzman and B.J. Novak). Thompson is hilarious during the early meetings, haggling with the writers over every detail. Even the scene headers (a part of the screenplay that simply designates interior or exterior and the location of a given scene) lead to an argument. As a parallel story, we see Travers’ hardscrabble upbringing in rural Australia. Young P.L. (Helen was her given name, she’s played as a youngster by Annie Rose Buckley) had an incredibly close bond with her alcoholic father (Colin Farrell). At first, these flashbacks seem almost like an intrusion. It’s so much fun seeing the adult Travers rebuffing everything Disney and Hollywood-related, it feels out of place seeing what at first feels like an almost certainly idealized youth. As both plots move forward, we see that Travers’ youth was no picnic and the past and present intersect in a surprising way. 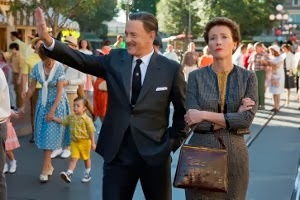 As an acting showcase, Saving Mr. Banks is the perfect vehicle for Emma Thompson. Hanks has a tougher time, mainly because we know the look and persona of Walt Disney so well. Hanks, while warm and likeable, never quite disappears into the role. But he’s really here in a supporting capacity, as is Paul Giamatti as Travers’ driver. 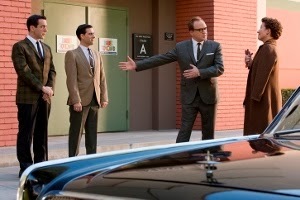 Giamatti is great as Ralph, who Travers initially dismisses as nothing more than hired help. She and Ralph develop a mutual respect, becoming good friends (I’d love to know if there’s actually a real-life inspiration for Ralph). Schwartzman and Novak are also terrific as the Sherman brothers, enthusiastically creating some of the most iconic songs ever to grace a musical film while Travers continually writes them off as hacks. As clichéd as it probably sounds, Saving Mr. Banks is the kind of winningly sentimental film that will leave you laughing and crying. Trite as it may sound, it’s true. Keep in mind, the scenes involving Travers’ increasingly unstable (and physically ill) father keep this from being entirely suitable for younger viewers. Saving Mr. Banks depicts the meeting of two egotistic visionaries, each with a very different way of working, which led to the creation of a beloved family classic. But it’s a very rocky road, with a surprising amount of depth. Don’t let the Disney iconography trick you into thinking this is a light family film. It’s very much an adult drama, and one of the year’s best. It’s every bit the charming confection you expect it to be, but it’s also uncommonly and unexpectedly thoughtful about the troubles of the creative mind and the travails of the creative process. It’s spoonfuls of salt that make this medicine go down.